Just 25 minutes southeast of Phoenix, Compass Christian Church (Formerly Chandler Christian Church) in Chandler Arizona recently completed the latest addition to their impressive youth center and recreation facility. Already well appointed with a skate park, gymnasium, climbing wall, game room and café, “The Bridge” now offers a versatile, 10,000 sq. ft. multi-purpose and live entertainment venue complete with lighting and a full concert-grade VUE Acoustic Linearity based audio system. The centerpiece of the church’s new state-of-the-art sound reinforcement solution is a VUE Audiotechnik al-8 subcompact line array, with VUE V6 Systems Engines supplying all amplification and processing, and VUE subs for low frequency support. “We’ve been deploying VUE systems for nearly a year now, and have been consistently pleased with their extended frequency response and exceptional intelligibility,” explained AVDB President and Founder Marty Waverley. Designed to function as both performance hall and recreation space, Chandler Christian’s newest space presented the AVDB team with a number of critical challenges, including highly reflective wood flooring and numerous exposed ceiling structures. Indeed exceptional pattern control was a critical consideration. 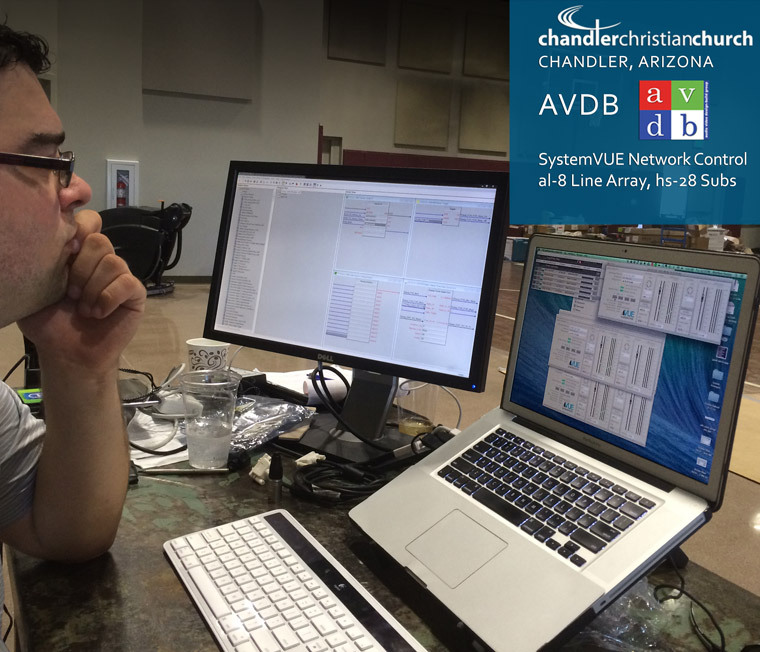 After creating an EASE model to determine the ideal al-8 configuration for the space, Nate Hall, AVDB’s senior AV designer, configured dual al-8 arrays of seven elements each. Five V6 VUEDrive rack mount Systems Engines deliver power and processing for the arrays, while a pair of hs-28 subwoofers and an Avid SC48 console round out the mix. For low frequency, AVDB specified a pair of VUE hs-28 dual 18-inch Active Compliance Management (ACM) subwoofers for the left and right of the stage. A forthcoming plan to install the subwoofers below the stage will see the hs-28s replaced by VUE’s dual 15-inch hs-25 ACM subwoofers later this year. But Waverley isn’t the least bit worried about the swap. For more information about Chandler Christian Church, visit www.chandlercc.org. Learn more about AVDB’s design and installation services at: www.avdb-group.com.